One of the most important figures in 1980s British comedy, thanks to his co-authorship of the seminal BBC sitcoms The Young Ones (1982/84) and Blackadder (1985-89) and his regular appearances as the fast-talking shiny-suited host of Channel 4 alternative comedy showcase Saturday Live (1985-87) and its successor Friday Night Live (1988), Ben Elton all but started at the top. Born in Catford, south-east London, he wrote his first play while still at school, and several more when studying drama at Manchester University. There, he met Rik Mayall and Adrian Edmondson , and followed them after his 1980 graduation to alternative comedy venue The Comedy Store, where he was both performer and eventually compere. There, he honed his trademark 'motormouth' persona - originally a way of conquering his natural shyness, it also proved handy when dealing with hecklers, by preventing them from getting a word in edgeways. His television debut was in BBC Manchester's series for teenagers, The Oxford Road Show (tx. 16/1-20/3/1981), but his major breakthrough came the following year, when Rik Mayall asked him to co-write a new sitcom project (alongside Mayall's then girlfriend Lise Mayer ) for BBC producer Paul Jackson that would act both as a showcase for the alternative comedy generation and a means of breaking down as many television barriers as possible. The result, The Young Ones (BBC2, tx. 9/11-14/12/1982) had a modest commercial impact (at least initially), but its cultural influence was colossal. Though it has inevitably dated very badly (ironically, much more so than The Good Life , the cosy 1970s sitcom that was a key target for its vitriol), it was the closest the BBC ever came to creating a peaktime series with a genuinely punk sensibility. The medieval sitcom The Black Adder (BBC, 1983) had been written by Richard Curtis and Rowan Atkinson and expensively shot on location. Both Curtis and Atkinson admitted later that it was lucky to get a second series, and the Elizabethan Blackadder II (BBC, 1985) was made on a sharply reduced budget. Elton was initially approached for script advice, but ended up replacing Atkinson as co-writer. The end result was vastly superior to the first series, the jokes running the gamut from the sophisticated to the scatological (often in the same sentence), and the Curtis-Elton partnership remained in place for the last two series (the Georgian Blackadder the Third , 1987; the World War I Blackadder Goes Forth , 1989) and various spin-offs ( Blackadder's Christmas Carol , 1988; Blackadder Back and Forth , 2000) - and also the first episode of Mr Bean (ITV, 1990). But by the late 1980s Elton had decisively emerged from behind the typewriter. Although he had had some onscreen experience (even parodying his Oxford Road Show appearances in The Young Ones ' mock youth TV programme 'Nosin' Around'), it wasn't until he became the regular host of Channel 4's alternative comedy variety show Saturday Live (1985-87) and its successor Friday Night Live (1988) that his face became as famous as his scripts. His politics, too, took centre stage - it was a rare monologue that didn't include a abusive reference to 'Mrs Thatch' or 'Normo Tebbs' (i.e. Margaret Thatcher and Norman Tebbit , at the time the Conservative prime minister and party chairman respectively), which made him a right wing tabloid target. However, his confident performances and ability to make carefully-scripted material seem spontaneous led to a week-long stint in 1989 standing in for Terry Wogan on the BBC's Wogan , which was then the highest-profile chat show on British television, as well as a thoroughly mainstream affair - it would be hard to imagine most of Elton's former Comedy Store colleagues managing this transition quite so smoothly. 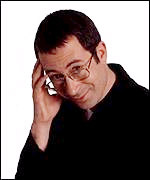 In 1991 the BBC gave him his first headlining show in Ben Elton - The Man From Auntie , which interspersed topical monologues with sketches, and which was successful enough to gain a second series in 1994, followed by the very similar The Ben Elton Show in 1998. Though The Young Ones and Blackadder established Elton as a major sitcom talent, his other efforts in the field were less successful. The underrated Happy Families (BBC, 1985), a Jennifer Saunders vehicle that was his first solo television script was a somewhat diffuse vehicle for Saunders' versatility as a character actress - she played five members of the same family as a conscious tribute to Alec Guinness in Kind Hearts and Coronets (d. Robert Hamer, 1949). Filthy, Rich and Catflap (BBC, 1987), which Elton also wrote solo for former Young Ones Rik Mayall , Adrian Edmondson and Nigel Planer . A showbiz satire with Mayall as a "resting" actor with delusions of grandeur, Edmondson as his violently scatological minder and Planer as his suave agent, it now looks like the bridge between The Young Ones and the subsequent Mayall/Edmondson vehicle Bottom (BBC, 1991-95). The Thin Blue Line (BBC, 1995-96), a sitcom set in a police station, reunited Elton with Rowan Atkinson, though its gentle humour had more in common with the work of Jimmy Perry and David Croft ( Dad's Army , BBC, 1968-77) than the sharp-witted Blackadder . In 1989, he published his first novel, the eco-thriller Stark (filmed by the BBC and the Australian Broadcasting Corporation in 1993, with Elton himself playing the lead), which would be the first of many. Popcorn (1996), a satire on the irresponsibility of the Quentin Tarantino generation, also became a successful stage play, while Inconceivable (1998), based on Elton's own experience of trying to conceive a child, was filmed as Maybe Baby (2000), which was also his film directing debut. His only other big-screen credit was in Kenneth Branagh's star-studded Shakespeare adaptation Much Ado About Nothing (US/UK, 1993), where he played Verges to Michael Keaton's equally buffoonish Dogberry. Most recently, he has devoted much creative energy to stage musicals, collaborating with Andrew Lloyd Webber on both The Beautiful Game (2000) and a screenplay for The Phantom of the Opera (albeit not the one used for the 2004 film), and wrote the critically panned but enormously successful West End Queen musical We Will Rock You (2002).